Can this digital mixer perform equally well in both the studio recording and live sound worlds? PreSonus have plenty of experience in analogue hardware, audio interface and monitor controller design, and have drawn on this in designing their StudioLive 16:4:2 mixer. This fully featured, stand-alone, four‑bus digital mixer is aimed as much at front‑of‑house as at recording applications, and is equipped with a Firewire port, so it can also act as a 32‑in, 18‑out audio interface. The idea is that you can use the mixer for live sound mixing while simultaneously multitracking the gig for a later mixdown. After the show, you can route audio back into the desk, using its processing and effects to reduce the burden on your computer. I've condensed the StudioLive's main features into a 'Vital Statistics' box, and will concentrate here on what it's like to use, and how it sounds. I've considered this mixer from a studio production perspective, but you'll be able to read a more live‑focused review in a forthcoming issue of our sister publication, Performing Musician. In the meantime, the 'Live Sound' box gives a quick roundup of the mixer's dedicated live sound features. Before I dive too deeply into the audio interface side of things, let's look at the mixer itself. The topology is pretty simple, with 16 preamp‑fed input channels, four subgroup buses, and a stereo master bus. There are eight aux sends (of which two are dedicated to a pair of internal mono‑in, stereo‑out effects processors), as well as a pair of stereo aux returns and two‑track I/O. A central section of buttons, rotary encoders and meters provides the only assignable controls on the console. Otherwise, you get one control per function. The primary role of the assignable controls is to access the main channel processing module (the 'Fat Channel'), which equips most inputs and outputs (including subgroups, main outs, aux sends, and aux/effects returns) with a powerful mix of dynamics and EQ. I make that 34 channels of processing, which is a big chunk of DSP power. Hit a Select button anywhere on the console and that channel's processing comes up on the assignable controls and meters for editing. Other buttons allow you to view and adjust the send level and pan settings for any particular aux-bus send, or to switch the meters to show audio levels passing through the console at various key points. Aux sends are switchable pre/post‑fader, as you'd hope, but you can also take the pre‑fader feed from before the Fat Channel compressor, via an easily accessible system preferences setting. Channel linking and bus routing is sensibly implemented, and a simple channel‑copy facility takes the sting out of applying similar settings to several tracks. You can save 100 different Fat Channel settings for later use, as well as storing the entire setup of the console in any of 100 Scene memories. The master section features basic controls for the two stereo returns and two‑track inputs, as well as allowing selection of AFL, PFL and in‑place solo modes. A simple monitor matrix pipes the mix of its input sources to the headphones and control‑room monitors, and a well‑specified talkback facility can feed three aux‑send pairs and/or the main outputs, depending on your needs. As of the v1.10 firmware, you can connect up to four of these mixers together using Firewire cables, in which case the aux, subgroup and master buses are combined to the unit you designate as the master. Effects sends remain independent for each mixer, although you could easily set up the same effects on each to simulate global sends, and you can also choose to leave the subgroups of each independent. All mixer recall functions are local to each unit, but you can lock all units at once from the master. You need more than a glance at the rear panel to take in the extent of the connectivity on offer in the Studio Live. Not only do you get 16 mic pres, but also inserts and direct outs on every channel, Firewire interfacing for your PC or Mac, and various additional outputs for control‑room and monitoring duties. The Firewire interfacing fits elegantly into the scheme: your recording software receives 16 audio streams from the mixer's main input channels (before or after the Fat Channel processing), as well as 16 streams selected in pairs from pretty much any of the signal buses. You can also send 16 channels from your software directly back into the mixer's input channels (again pre‑ or post‑Fat Channel), as well as routing a stereo monitoring feed to the two‑track return and/or monitor matrix. Firewire returns from the computer are activated via dedicated backlit buttons dotted around the console. Let's look at how you'd work with this system in practice. While tracking, you could have unprocessed mic channels feeding the computer for recording, while using the Fat Channel and onboard effects to deal with the various monitor mixes for your performers. For simple overdubbing, you could feed the backing track through the monitor matrix to your performer, and record him/her as before. Alternatively, if you want more monitoring control, you could route mix stems to spare channels on the console, alongside your recording channels. At mixdown, you could send mix stems to all the mixer's input channels, to access the Fat Channel processing, subgroups and internal effects, and then record the StudioLive's master bus back into the computer. What you can't do is route the outputs of the computer to mixer channels pre‑Fat Channel, and route the signals back into the computer post‑Fat Channel: both send and return are switched pre/post‑processing with the same button, so if you want to bounce individual tracks back into the computer with processing, you'll have to send them to a mixer channel pre‑Fat Channel, route them to a send or output bus and take the Firewire return signal from there. Installing the ASIO, WDM and Core Audio drivers is straightforward, and you use the Universal Control utility to adjust the sample rate and various buffer sizes of any PreSonus hardware connected to your computer. You're also given a very basic DAW program called Capture. No matter how I set the buffer sizes, I couldn't achieve software monitoring latency below about 24ms (in PC versions of Cubase 5 and Reaper 3, or with Logic 8 on a MacBook Pro). If you're planning to do all your studio cue-mixing in the StudioLive itself, this may not be a problem, but if you want to use software monitoring (for tape‑style automatic input/playback monitor switching, for example), or to play soft synths live, this degree of latency could feel cumbersome. 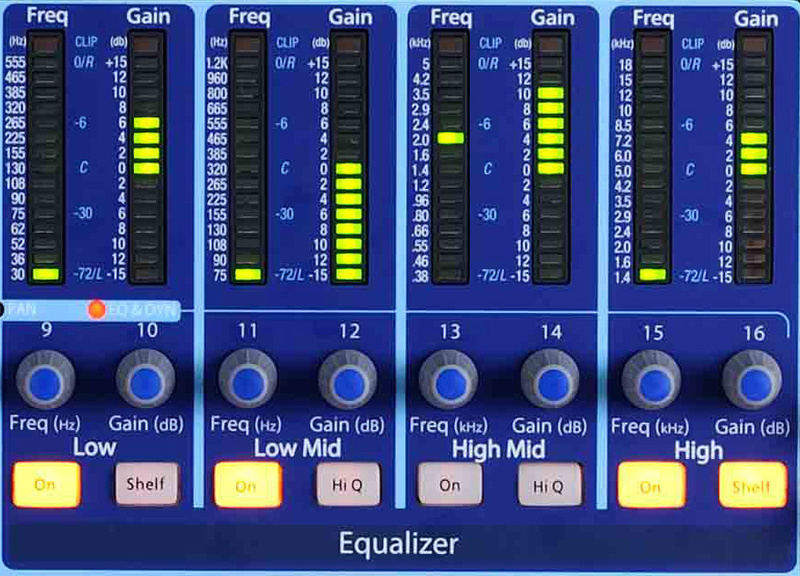 The LED displays for the EQ (pictured), compressor and other processors make it very easy to see the settings for the selected channel at a glance. At just over 10kg, the StudioLive hardware isn't a back‑breaking heft, but it has an air of solidity and robustness. The raked front panel has the advantages of making the aux and preamp controls easy to see on the desktop, and the fader action is lovely — light, but with a well‑judged resistance. Both the 270‑degree and endless rotary controls offer good resistance, to help you avoid mishaps. The chunky rubber buttons illuminate brightly to show their status, and the different light colours make finding controls and assessing the desk's status painless. The solo‑in‑place mode button needs to be held for a second to activate it, which is a worthwhile safety measure, but it would have been sensible also to apply this approach to the phantom‑power buttons, which are a little too easy to toggle inadvertently. Adjusting the Fat Channel processing with the assignable controls took me a little while to get used to, because of the physical distance between each knob and its associated parameter display, but with a little familiarity this became quick to use. Assessing the state of the processing at a glance wasn't as easy as on digital consoles with proper LCD graphical displays, though, and PreSonus could have made this a bit easier by, for example, using different coloured panel backgrounds to differentiate the Frequency and Gain LED bar-graphs. In a similar vein, it was tiresome on occasion that there was no way to poll the status of a single parameter (such as output routing) across all channels. The only option is to punch through each of the 30‑odd Select buttons while watching for the relevant Fat Channel light. It's also not possible to scrutinise all the send levels for an individual channel at once: again, the only solution is to get manic with the Select buttons. It's nice to have a good range of solo modes, but I still felt that improvements could be made. Solo‑in‑place worked fine, with internal and external effects returns remaining solo‑safe, but there was no option to defeat this for the external returns if you wanted to use them for, say, sound modules rather than external effects units. The normal PFL/AFL didn't work quite as I'd expected: the problem is that in order to hear just the output of the solo bus, you have to select only the Solo button in the monitor matrix. If you do this and have nothing actually solo'ed, you don't hear anything, whereas I'd expect the monitoring to default to the main mix in this case. If you're monitoring your mix, then, and decide to solo something, you first have to turn off the Main matrix button and engage the Solo matrix button before it will work, and reverse the procedure when you want to hear the mix again. I spoke to PreSonus about this, and it is apparently intentional: they say that they anticipate people leaving the Solo monitoring button on all the time, and just switching Main off when necessary. It still seems rather laborious to me, though. By contrast, the talkback facilities are right on target, because although you don't have a built‑in mic, you get the same grade of preamp on the talkback input as on the main channels, and completely noiseless switching. It might seem a trivial issue, but having a hi‑fi communication signal can make a big difference in establishing a good vibe between the producer and the performers. Furthermore, because you can access the talkback channel from the computer over Firewire, you can use it as an extra recording channel without fear of any quality loss. Monitor dimming is intelligently handled, with only those outputs selected as talkback destinations in the master section dimming their outputs when the big, red, latching Talk button is lit. If the firmware were updated to make the amount of dimming user‑adjustable, that would be the icing on the cake. Another curiosity of the monitoring facilities is the level control in the '2 Track In' section, which affects both signals from the mixer's rear‑panel, two‑track machine inputs, plus the separate stereo monitoring feed coming from the computer over Firewire. You could say that it's unlikely users will have both these sources going at once, hence the communal volume control, but on that basis it would be odd to have separate mix‑assignment buttons. Whatever your view, it's as well to know that this is how it works. In all, the StudioLive feels pretty straightforward to use after a couple of hours getting to know it, and the manual makes it pretty easy to find information on features you're unsure about. There's no block diagram in the book, but you can download one from PreSonus' web site, and that significantly speeds up the process of learning how all the routing works, especially regarding the aux sends and Firewire streams. The preamps in any digital mixer or audio interface are a primary concern for many purchasers, because they're one of the only things you can't bypass while recording, so it's a pleasure to report that the XMAX preamps on the StudioLive are great all‑rounders. They provide a healthy 65dB of clean gain and cope well with acoustic instruments and speech sources, which can ruthlessly expose unnatural colorations in lesser designs. The tone is understated, but with a certain extra clarity and openness; a fraction airier than some other preamps I've heard, and with mildly recessed low mid-range. This flavour is subtle, and manages to flatter gently without compromising the circuitry's ability to deal with a wide range of instruments. The quality of the channel processing is, likewise, vital to the appeal of a mixer. The variable high‑pass filter is great: you can go from dealing with inaudible subsonics to completely decimating the mid-range with a flick of the wrist. It's also good that this filter comes before the compressor (the main EQ is fixed post‑dynamics), because it's thus easy to deal with subsonic rumbles that might interfere with the compressor's action. The compressor can be a bit of an animal, as the ratio goes up a long way, and its attack and release times can be set short enough to push most instruments into nasty distortion: I'm a fan of distortions, but didn't find this one particularly appealing. Despite its pointy fangs, though, the compressor is actually one of the highlights of this desk. Its swift severity can really take a hammer to the envelopes of drums and percussion sounds, allowing you to substantially reinvent them, but switch in the soft‑knee mode, set a low threshold, and take advantage of the fine resolution of the ratio control at low settings, and you can gently tease out detail, intensity, and sustain from a range of instruments (vocals in particular) without giving the game away. I like this compressor a lot, but a practical limitation is that the release times feel faster than the stated 40‑1000ms parameter range suggests they should, which makes it difficult to firmly control levels of percussive sounds, for example, without also altering the nature of their level envelopes. It also makes the compressor prone to excessive sibilance if you do heavy vocal compression. 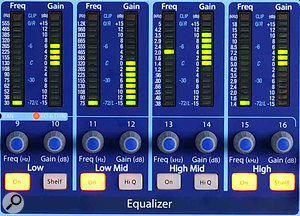 The EQ performs well on gutsy and percussive sounds, delivering a tight, focused end-product. The resolution of the controls is much finer than the discrete LED‑ladder displays suggest, and I couldn't detect any 'zipper' noise, which is a good sign. Like a lot of its analogue counterparts, this digital EQ lets you know it is working well before you have to crank the pot, and I particularly liked how it could drill away at undesirable frequencies to leave only the bits I needed. The code seemed better at punch and presence than warmth or smoothness, though, and I'd use other processing if I planned to do much boosting, especially at high frequencies. Compared with many digital console EQs, the controls of this one seem to have been deliberately stripped back to make it easier to use in a high‑stress live environment, which, unfortunately, reduces your options in the studio. There's a lack of proper variable Q controls on the mid bands, but the two available Q settings actually complement each other rather well in practice, so my main concern was the degree of frequency overlap between the bands. Most of all, I thought that the high reach of the two mid‑bands might have usefully been extended for studio work, so that you could add air at 15kHz, but still take out harshness at 8kHz, especially given the tendency towards emphasised sibilance in PreSonus's compressor design. The other components of the Fat Channel are fairly no‑nonsense, but otherwise well‑behaved. The expander/gate seemed fine for basic removal of unwanted noises, although the lack of side‑chain filtering might cause it to struggle with spill‑reduction duties on multitracked drums. The limiter is a nice little extra: its release time feels longer than the compressor's, though its lack of adjustable controls makes it more appropriate for safety limiting than creative mix processing. The bottom line is that I wouldn't hesitate to use the StudioLive's internal channel processing to supplement an in‑the‑box mix, in order to reduce the strain on my computer's CPU, because what's on offer is powerful and capable of great results. I'd be disinclined to rely on this mixer for all my mix processing, though, as its sound character and live‑oriented streamlined operation don't leave quite enough flexibility to cope with some of the thornier mix problems. Like a number of recent computer‑related products, the StudioLive is clearly looking to carve out its own market niche by offering a unique balance of features, which leaves two main questions for the potential purchaser: does the feature set fit my needs; and does the experience of using the product match the promise of the specs? 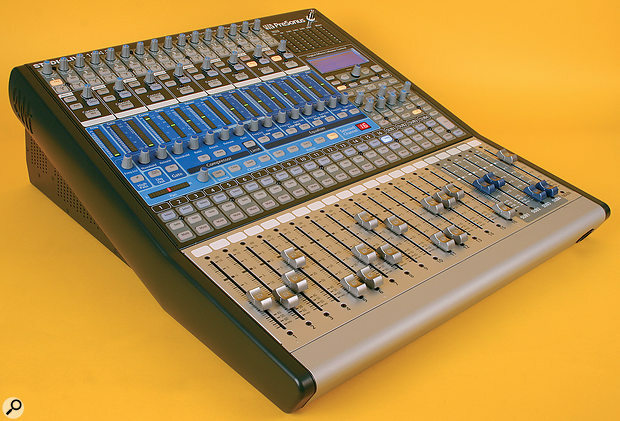 This product scores best if you need a dual‑purpose live/studio console: while taking care of the front of house, it can be siphoning off pristine‑quality, unprocessed, multitrack audio for later use, as well as archiving the board mix; while tracking in the studio, you can set up multiple high‑quality cue mixes with processing, vanity effects and excellent talkback at the drop of a hat; and while mixing, you can send stems to the respectable Fat Channel processors and dual multi‑effects, taking the strain off your CPU. If you're looking at the StudioLive exclusively for studio use, you probably need to be regularly recording ensembles, requiring multiple cue mixes, to make the outlay justifiable. In such circumstances, the ability to record completely clean preamp outputs, and at the same time have good talkback and fast hands‑on control over monitor‑mix processing/balancing is great. The lack of word clock synchronisation or elevated sample rates may put off some audiophiles, but the vast majority won't give that a second thought, especially because PreSonus's A‑D conversion sounds nice and clean. Some users may find the monitoring latency through the console (in the order of 3ms) a bit unnatural when working on headphones: the delay is not as large as with software monitoring, but is still noticeably different from monitoring in the analogue domain. If you don't really need the StudioLive's powerful, hands‑on cue mixing, and you're actually more concerned with tactile control and processing at mixdown, then you can get 16 high‑quality preamp inputs (as well as digital and MIDI inputs) for much less money in rackmount form, leaving you with cash in hand to invest in more flexible processing plug‑ins and a moving‑fader control surface. In answer to my second question, assuming that the feature set as it stands appeals to you, I have to say that the StudioLive is a good, solid product and is a pleasure to use. The preamps are very good, the channel processing plentiful and powerful, and the operating system friendly and reliable. What it lacks in features and flexibility, compared with more in‑depth and assignable digital mixers, it makes up for in ease of use. For recordists working under pressure in both live and studio environments, it's currently in a league of its own. The closest comparable product is probably the Yamaha N12, given its digital mixer, Firewire audio interfacing and simplicity of control, but that has fewer preamps, fewer channels of Firewire audio and no Scene memories. If you'd prefer analogue mixing and true zero‑latency monitoring, there are several Firewire- and USB‑equipped mixers with multi‑channel interfacing, Mackie's Onyx 1640 and Allen & Heath's ZED R16 probably being the most interesting contenders in this price range. A more powerful option is Yamaha's latest O1V96 digital mixer, although you'll need to run audio into and out of a computer in Yamaha's mLAN format, via an optional mini‑YGDAI card — which, of course, bumps up the price. Analogue I/O: 16 phantom‑powered mic/line preamps, each with XLR mic input, TRS jack balanced line input, and analogue insert point; 16 balanced pre‑insert direct outputs accessible via two 25‑pin D‑Sub connectors; balanced TRS jacks for six aux outputs, two stereo aux inputs, four subgroup outputs, stereo main outputs, and stereo control‑room outputs; unbalanced RCA phonos for stereo two‑track inputs and outputs; four XLR stereo main outputs and separate mono sum output, each with rear‑panel rotary level trimmer; phantom‑powered XLR talkback mic input with up to 40dB gain via rear‑panel rotary control, and additional front‑panel level control; stereo headphone output. Digital Processing & I/O: Supports 24‑bit resolution at 44.1kHz or 48kHz sample rates; internal 32‑bit floating‑point processing; stereo digital output via coaxial S/PDIF connector. Channel Processing Facilities: Switchable polarity inversion and variable‑frequency high‑pass filter (inputs only); expander/gate with variable threshold and release controls; compressor with threshold, ratio (1:1‑14:1), attack (0.2‑150ms), release (40‑1000ms), and gain controls, as well as soft‑knee and auto‑attack/release modes; separate switchable limiter (threshold preset at 0dBFS); four‑band EQ (LF: 36‑465Hz; LMF: 90Hz‑1.2kHz; HMF: 380Hz‑5kHz; HF:1.4‑18kHz) with bypass switch and ±15dB gain in each band, switchable shelf/peak response for outer bands, and switchable Hi Q mode for inner bands. Effects Processing: Dual mono‑in/stereo‑out delay‑reverb processors, with returns switchable to aux, subgroup and main output buses. Metering: 24 16‑segment LED bar-graphs for channel/bus levels, gain reduction and parameter‑value display. Recall: 100 Fat Channel memories; 100 Scene memories, with partial recall options; 100 Effects memories. Dimensions: 22.35 inches (568.06mm) long, 17.22 inches (437.4mm) wide, 6.9 inches (175.26mm) maximum height. A traditional benefit of digital mixing is the ability to store complete mixer setups and recall them in an instant. The StudioLive provides memory space for 100 such 'Scenes', each a record of all the mixer's level, routing, processing and effects settings. You can choose to recall partial Scene settings, if you wish (for example, just the Fat Channel and bus assignments), but there's no way to exclude specific channels from the recall, as there is on some desks. Great in principle as the Scene recall is, the unmotorised level faders and pots mean you'll typically find that a number of the parameter settings for a recalled Scene won't match the physical positions of their respective hardware controls. For the faders, you automatically find yourself in a special Faders Locate mode upon recalling a Scene. In this mode, the faders don't have any effect on the channel levels (which are set to the values in the Scene), and the meters show the disparity between the current setting of each physical fader and its stored position — so you can manually correct the physical faders. Once you exit Faders Locate, the channel levels revert to reflecting the physical fader positions, irrespective of whether you actually matched the fader positions correctly. This system works fine, but it's not something I'd attempt in a hurry, as it does take a minute or so to get through all 21 faders if you want to be accurate. Recall of the rotary level controls is more problematic, because (puzzlingly) there's no equivalent to the Faders Locate mode for them: the internal parameters zap themselves to the stored settings, and the controls are left wherever they happen to be. If you grab any of them, the parameter instantly reverts to following the physical control, irrespective of whether that causes a huge level jump! What's more, there's no way to tell before you reach for any given rotary level control whether it's at its stored value or not — so you never quite know what you might get as you adjust each control following a Scene change. Most people will prefer to defeat Scene recall of the pots completely (which, fortunately, is an option). As it is, PreSonus suggest that you fill in a paper recall sheet for each mixer Scene to save these settings (and, indeed, the mic preamp settings). Remind me, please... what year is it? The twin effects processors offer a choice of 13 delay‑reverb algorithms: Ambience, two Rooms, five Halls (one of them gated), Plate, and four Delays (Mono, Filter, Stereo, Ping‑pong). You can quickly set delay times using a tap‑tempo button, and there are between one and six editable parameters, accessible via the commendably shallow LCD‑based menu system. Edited patches can be saved into 100 memory locations, 50 of which come pre-loaded with sensible presets. The delay algorithms seem to cover the most important bases, and the editable parameters have been well selected. The only fly in the ointment is that delay times can only be set in 5ms increments, which isn't fine enough for me while mixing. The reverbs aren't particularly spacious, but they sound nicely smooth and satisfying in a mix context, and seem to include some modulation that's pretty successful at keeping metallic resonances at bay, even on drums. The slightly vague sense of dimension means that the different reverb algorithms don't feel as distinct from each other, sonically, as I'd normally expect, but that's not to say they won't be useful in a lot of mixing situations: like many less 'natural' reverbs, I'd look to them for the richness of their character, rather than for a realistic sense of location. The StudioLive has several live-sound oriented features. The mono output can be used for external powered subwoofers, for example, and the individual rear‑panel output trims for both main and mono outputs help match the desk levels with the PA you happen to be using. A 12V BNC socket on the front panel can feed a gooseneck lamp, although the LCD is already backlit and the console lights are themselves bright enough to give a certain amount of illumination. Another useful feature is that you can lock all the controls to prevent curious punters tampering with them while you hop off for a pint. A five-digit password needs to be entered, using the channel Select keys, to enable and disable the lock. Finally, the latest firmware version includes a master 31‑band graphic EQ, which you can drive from the assignable controls, switching between the bands in two banks of 16. 16 high‑spec preamps and 32‑in/18‑out Firewire interfacing. A well‑balanced feature set catering for live mixing, studio recording and pretty much anything in between. Fast, intuitive operation via robust hardware and reliable operating system. Extensive onboard 'Fat Channel' DSP processing and dual multi‑effects. Solo and Scene‑recall functions rather clunky. No external digital synchronisation or elevated sample‑rate support. The parameter ranges in the Fat Channel processing limit the mixer's scope as a general‑purpose mixing tool. Real‑world software monitoring latency through the drivers was rather high on both PC and Mac review systems, even at the smallest buffer sizes. Despite a few operational niggles, the StudioLive 16:4:2 is a strong and innovative product that successfully services live and studio requirements without presenting an intimidating learning curve. As with all ambitious products, there's some room for improvement, but on the whole PreSonus have come up with a commendably flexible mixer. Presonus +1 800 750 0323. PreSonus Studio Live 16:4:2 firmware v1.11. PreSonus Universal Control utility v3.4.0.5254. Steinberg Cubase v5.0, Cockos Reaper v3.0 & Logic Pro 8.0. PC: Rain Recording Solstice O3 PC with AMD Phenom II X4 810 quad‑core 2.61GHz processor, 4GB DDR2 RAM and Windows XP Pro with Service Pack 3 v3264. Mac: MacBook Pro 2.33GHz Intel Core 2 Duo, 3GB DDR2 RAM and OS 10.5.7.